This article is designed for the beginning finch keeper and what follows is the minimum that you must know before keeping finches. 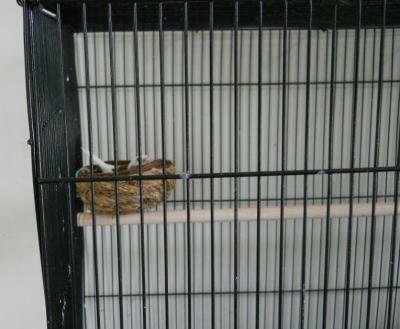 When I first decided to keep finches I didn't know the first thing about keeping them. I read a few books and asked a lot of questions at the pet store. After learning all I could about them I decided to get two little finches and I created this site so that I could share the information I've learned about keeping them. I've been keeping finches successfully for several years now. How Many Finches Should You Keep Together? The first thing you need to know about keeping finches, such as zebra, society, or spice finches is that you cannot keep a solitary bird. These small finches don't thrive when kept alone. You must keep at least two finches or your finch will probably not survive, and at the very least, will be a very unhappy bird. Keeping even numbers of finches is better than keeping odd numbers. So, you need to have either 2 finches, 4 finches, or 6 or 8 finches, but not 3 or 5. Keeping odd numbers of finches might lead to aggressive behavior. 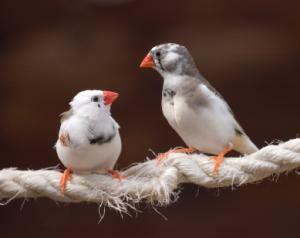 Can You Keep Zebra Finches and Society Finches Together? While zebra finches seem to be available year round in most pet stores, society finches are sometimes hard to find. Birds, most likely, would prefer to be with their own species, however, rather than keep a single bird of one species in a cage, it is preferable to get him or her a little birdie friend even if the bird is of a different, but similiar, non agressive species. I had this happen once: I had two society finches that had been together for several years when one of them suddenly died. I repeated called every pet store in the area for 2 months to see if they had society finches, but none of them did. Rather than keep one lone society finch (who looked fairly unhappy while alone), I decided to get him a female zebra finch and hoped that they would get along. They did get along and the society finch seemed so much happier and more lively once his zebra finch companion was placed in his cage. Both birds did just fine together. They even slept in the nest together each night. I don't know about housing other types of finches together because I have not tried this. Another important factor to consider is their cage. Finches need a special cage that allows them to fly. This is generally called a flight cage. Their cage should be at least 30 inches long, 18 inches high, and 18 inches wide (76.2 cm long, 45.7 cm high, 45.7 cm wide) . This is the minimum sized cage that you need to keep your finches in. The largest cage you can afford is best. The reason that finches need a cage that allows them to fly is that they live their entire lives within the cage. Unlike other birds, such as parrots, finches are not tame birds, despite their exposure to humans from birth. Finches don't like to be handled and so they generally don't have "out of cage time" like tame birds do. In fact, it may be dangerous to allow your finches to fly free about the house as they may run into windows. I wouldn't keep more than four small finches in a cage of this size (30 in x 18 x 18) and probably one pair of birds is best. You don't want the birds to feel overcrowded. The larger the cage the more finches you can successfully house and a larger cage is always best. Also, make sure the bar spacing of your finch cage isn't greater than ½ inch apart. Finches are small birds with small heads and they can get their head stuck in between the bars, or even escape from the cage, if the bar spacing is too wide. An example of a suitable finch cage, especially if you are just starting out can be found below. This is the cage that I use for my birds and they've been very happy in it. The bigger the cage the happier both you and your bird will be. Finches usually do just fine at room temperature (around 70 °F or 21 °C). You'll need a couple of perches of different sizes. However, don't fill your bird cage so full of perches that your finches don't have any room to fly. Two perches is probably sufficient unless you have a large number of birds. Often the perches that come with your cage are sufficient. You'll often hear that you must have perches of varying sizes, however, I've found that my finches often cling to the cage bars as well as the perches and so this might not be necessary. The reason that perches of varying sizes are recommended is so that your finches can exercise the muscles in their feet, so if you have the room in your finch cage, then vary the perch size. Perches with rough edges, such as concrete perches are beneficial. Rough perches will wear down the finches' nails so you they don't grow so long and you won't have to cut them. Care must be taken when using perches that attach to the cage. I had one pet society finch get her leg/toe stuck in between the cage and the perch. When I found the finch she was hanging upside down in the cage by her toe. She injured herself severely by thrashing around trying to free herself. I thought that she wouldn't survive, but finches are tougher than they appear and thankfully she made a full recovery. You'll probably hear and read that you need to put cuttlebone as a calcium source in your finches' cage. However, most of the finches I've owned have completely ignored the cuttlebone I've put into their cage. It doesn't matter whether I get flavored or not. Because of this, instead of buying the cuttlebone I get the cuttlebone powder for birds. I just sprinkle a little of it onto their food each day. I generally also use a beak conditioner as well. This consists of a natural lava stone that is placed in the bird cage so that the birds can wear down their beak. These are also inexpensive and you can find these at most pet stores. In general, finches don't play with toys as much as parrots do, however, your finches will still need something to do other than hanging out in their cage. What I use for my finches is a nest hair dispenser. This is a round disk with little pieces of string in it. The birds can use their beaks to remove the small pieces of string from the dispenser and helps to keep them occupied. Small streaming toys for birds are also fun for your finches. I usually use a "parrot pinata." This is basically a toy that hangs from the cage ceiling and has long streamers for your birds to play with. Strangely, I had some finch chicks that hatched and grew up in a cage without any toys. When they were adults I bought them a parrot pinata like that shown in the above Amazon.com link. Both birds were terrified of the pinata. I actually had to remove it from the cage. Oddly enough, their parents absolutely loved this toy. I think perhaps the babies just didn't know what it was. 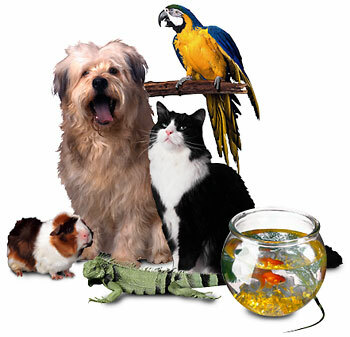 You can find good quality finch food at your pet store. Buy a food that states that it is specifically for finches. You can also supplement their diet with bird treats, such as honey sticks, and also with fruits and vegetables from the grocery store. You can give them foods such as oranges, apples, grapes, cherries, matchstick carrots, and parsley. Be sure the vegetables have been thoroughly washed before giving them to your birds. Remove any uneaten fruits or vegetables from the cage within a few hours so that the food doesn't spoil and make your birds sick. My favorite finch food is Healthy Select for canaries and finches, but unfortunately I haven't been able to find it anymore. I liked it because it contained natural dried plants as well as the seeds. It is also free of free of artificial colors, flavors, and preservatives. Finches will also eat insects - mealworms are a finch favorite. A finch with a varied diet will usually not need vitamins, however, if you only feed your finch one type of food (such as packaged finch seeds) then you may need to supplement their diet with bird vitamins available at the pet store. However, you must be very careful not to overdose your birds. More vitamins isn't better and may harm your birds. Finch pellets are often touted as a finch superfood, but many finches don't seem to like them. Even if your finch will eat the pellets I still believe that finches can benefit from a more varied diet that includes fresh fruits and vegetables. I often have difficulty getting my finches to eat anything other than their bird seed. For a list of foods that are harmful to finches (and most pets) please see the article Finch Food - When Seed is Not Enough. This article also provides tips for getting your finches to eat more foods than just seed. Like all living creatures, birds need a clean water supply available at all times. Shallow water dishes are best (about 1 inch deep) and it is best if the water dish is large enough so that your finch can take a little bath in it as well. My finches absolutely LOVE splashing around in their water dish. It is very important to clean out your finches' water and food dishes daily. Take care not to place your finches water and food dishes underneath a perch or bird droppings will land in it and spoil the food and water. Finally, you can buy commercial finch nests at the pet store as well. For finches, you'll usually hear that the best kind are the enclosed kind with a small opening. You can keep finches without a nest, however, if you intend to breed your finches you will definitely need to provide them with a nest. However, don't attempt to breed young finches - wait until they are close to a year old before trying to breed them. The nests should be hung from the cage ceiling. Each pair of birds you are housing will need a nest if you intend to breed them and to prevent fights over which pair gets to reside in the nest. Oddly enough, despite all of the info suggesting that finches like the closed-type nests, mine seem to prefer the open nests. My finches completely ignored the closed-type nest I put int their cage, but made themselves a home, and even layed eggs and raised a bird family in the open nest. Below you'll see links to the kind of nests and nesting material that I use for my birds. I've even had some pet finches that prefer to take all of the nesting materials and build their own little nest in the bottom corner of the cage floor. The finches that I've had do this have built quite elaborate nests on the cage floor and they seem very happy in the nest they've made themselves and tend to ignore the store bought nests. If you don't want your finches to breed then don't include a nest in their cage. However, keep in mind that many finches prefer to sleep in nests and so they will be happiest with a nest. An alternative is to remove their eggs and replace them with "fake" eggs, which can usually be purchased at the pet store. Breeding very young birds is not recommended. Can Dogs and Pet Birds Live Together Safely? Budgerigar photo by Ian Martinez and obtained from Wikimedia Commons and published under the Creative Commons Attribution 3.0 Unported License. Image has been resized - smaller. Copyright © 2008-2018 TwoLittleFinches.com. All rights reserved. Bird Favicon by Gina Mikel. Image of fawn pied society finch (top right hand photo) from Wikimedia Commons. and published under GNU Free Documentation license.